490,000 Pounds of Toxic Pesticides Sprayed on National Wildlife Refuges. 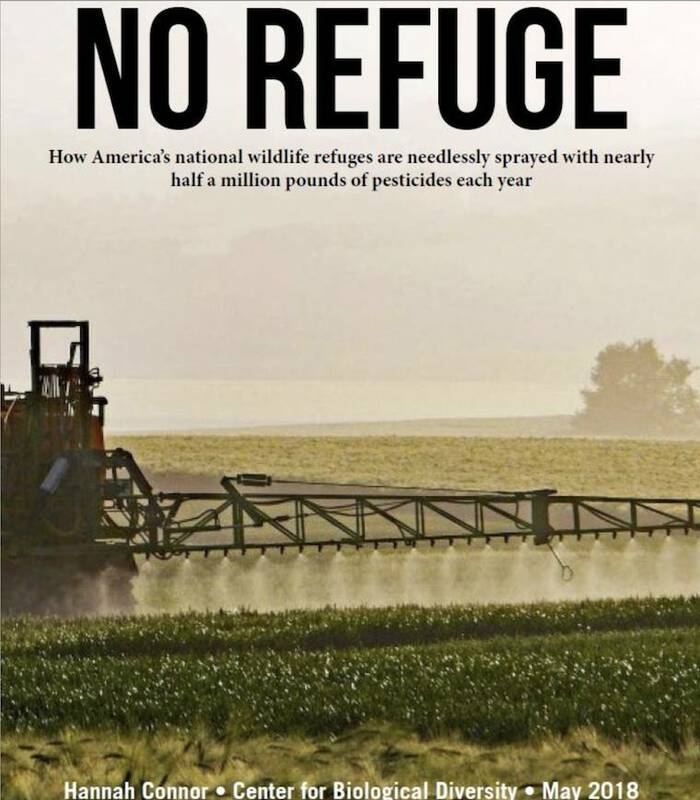 Read the PDF: NO REFUGE - How America's national wildlife refuges are needlessly sprayed with nearly half a million pounds of pesticides each year. America’s national wildlife refuges are being doused with hundreds of thousands of pounds of dangerous agricultural pesticides every year, according to a first-of-its-kind analysis by the Center for Biological Diversity. The Center report, No Refuge, reveals that an estimated 490,000 pounds of pesticides were dumped on commodity crops like corn, soybeans and sorghum grown in national wildlife refuges in 2016, the most recent year for which data are available. The analysis was conducted with records obtained by the Center under the Freedom of Information Act. The pesticides include the highly toxic herbicides dicamba and 2,4-D, which threaten the endangered species and migrating birds that wildlife refuges were created to protect. Refuge pesticide use in 2016 was consistent with pesticide applications on refuges over the previous two years, the Center analysis showed. America’s 562 national wildlife refuges include forests, wetlands and waterways vital to thousands of species, including more than 280 protected under the Endangered Species Act. Yet intensive commercial farming has become increasingly common on refuge lands, triggering escalating use of highly toxic pesticides that threaten the long-term health of these sensitive habitats and the wildlife that depend on them.